Funeral services for Mary E. Richardson will be held at Price-McElroy Funeral Home in Kenton on Friday, March 29, 2019 by Reverend Gregg King. Burial will follow at Grove Cemetery. 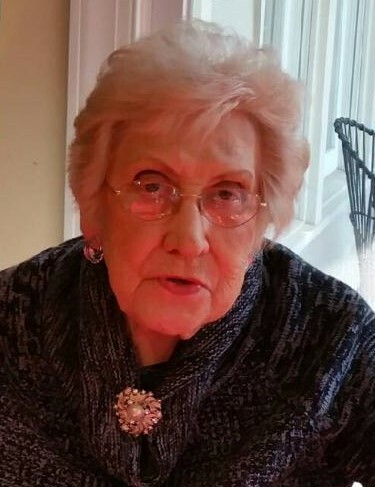 Viewing for friends and family begins at 10:00 a.m. with the memorial service following at 12:00 p.m.
She died on March 23, 2019 in Raleigh, N.C.
She was born on September 9, 1927 in Kenton, to Dewey and Agnes (Cosart) Gray. On Oct. 26, 1943 she married Charles Vernon Richardson. The two were married for 64 years, until Charles’ death in 2008. Surviving are a daughter, Elaine (Jim) Holly of Raleigh, N.C; a son, Chuck (CeCe) Richardson of Kenton; grandchildren, Aaron (Lori) Holly of Raleigh, NC, Paige Marie (Ty) Hayes of Silverthorne, CO, Tony Richardson of Kenton, OH, Eun (Matt) Kaderly of Westerville, OH, Todd Holly of Grand Rapids, MI and Mark (Deb) Holly of Kenton, OH; nine great-grandchildren Spencer Holly, Lincoln Kaderly and Madeleine Kaderly, Brandon James Holly, Cameron Holly, Jaysen Holly, Alex Holly, Jensen (Kelsey) Holly, LaKean Holly, two sisters Dorothy Shadley and Terrissa Sparks, both of Kenton. She was preceded in death by her husband Charles, her sister Roxanne Richardson and three brothers Donald Gray, Ted Gray and Merle Duane Gray. She was a lifetime member of the American Legion Auxiliary and the VFW Auxiliary. Memorials may be made to the Hardin County Humane Society. | 123 N. Main St.